Plastic Pollution a Cautionary Tale. Concern about plastic pollution, according to scientists, is no longer just about the unsightly litter we see just about everywhere we go. Increasingly concern is growing about the toxic contaminants associated with and attracted to plastic debris. Plastics contain many toxic chemicals, such as flame-retardants, aromatic hydrocarbons, Bisphenol A, and phthalates in their manufacture. The concern now is that these chemicals may be leaching out of the plastic into the environment and into the food chain. It has also been suggested that Bisphenol A may be leaching into sea waters from the epoxy resins on boats. Bisphenol-A (BPA) is an industrial chemical that’s been used since the 1960s in the manufacture of polycarbonate (PC) plastics, polyester resins, epoxy resins and those two part paints. BPA is also used to make thousands of other products from safety equipment to eyeglasses to computer and cell phone casings. It is also used in food packaging, such as the epoxy resins lining on the inside of metal food and beverage cans. It has been suggested that BPA (even in trace amounts) may result in an array of health problems, such as chromosomal and reproductive system abnormalities, impaired brain and neurological functions, cancer, cardiovascular system damage, adult-onset diabetes, early puberty, obesity and resistance to chemotherapy. The concern now is not so much that it is imbedded in plastic but that it can leach out. Should We Be Concerned about Plastic Pollution? I'm afraid that I don’t know. I have had no scientific training (apart from making stink bombs as a schoolboy). The best that I can do is to highlight the fact that there is growing concern among the environmental health lobbies and in some governmental circles. The use of BPA in baby bottles and ‘sippy cups’ has been banned in Europe and Canada. The Great Lakes and Environment Committee of the Michigan House of Representatives approved a bill that will eventually ban the manufacture, sale, and distribution of several plastic items found in the average American pantry. In May 2009, Minnesota became the first state in the USA to ban BPA from plastic baby bottles and sippy cups and Connecticut, Chicago, Suffolk County, NY, and other areas have imposed similar prohibitions. And several plastic bottle manufacturers and retailers have stopped or decreased production of the chemical in response to lessening demand from concerned consumers. Material Data Safety Sheets and Technical Data Sheets are notoriously inconsistent in their level of detail and generally fail to reveal proprietary blends and processes. The manufacturer’s response is usually that any toxicity levels in their products are well below safety standards. However, where studies have been made into the levels of BPA contamination in the environment is has been noted that levels seem to be rising. Under normal conditions the BPA in that plastic pollution it does not readily degrade in the environment, it just continues to accumulate. Unfortunately scientific research has only recently begun to address the issue. And the subject is highly political, with environmental political pressure groups on one side, manufacturers on the other and us consumers as the 'guinea pigs' in the middle. But lest we forget, Bisphenol A is an endocrine disruptor, DDT, is also an endocrine disruptor, it was once touted as a wonder product untill it was eventually banned, after a great deal of damage had been done. In the mean time Plastic Pollution is still creating unsightly litter and still seen just about everywhere we go. And if having toxins leaking from the packaging isn’t enough what about the toxins from the products inside? 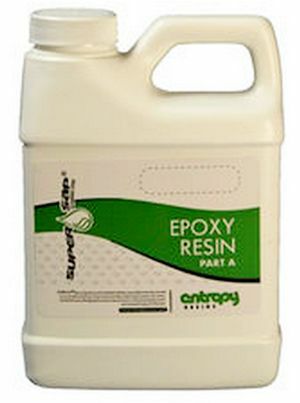 Entropy Resins are made using a plant-based epoxy called "Super Sap" instead of petroleum based products. Not only is “Super Sap” resin is sustainable but you can apply without fumes so there is no need to wear a respirator. Environmental benefits include bio-based content sources, a reduced carbon footprint and less plastic pollution. “Super Sap” uses a pine pulp based resin sourced from by-product of paper manufacturing processes and plant based byproduct from bio fuels processing. It's relatively low viscosity and great adhesion to all substrates makes it an excellent composite laminating resin. Some products even feature air release additives that allow for smooth brush on coatings.